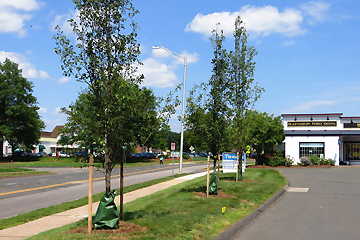 26 large pin oaks, pears, tupelos, maples and other trees now grace Glastonbury streets thanks to a grant from the Norma and Natale Sestero Fund at the Hartford Foundation for Public Giving at was awarded to GPIP, late in 2014. 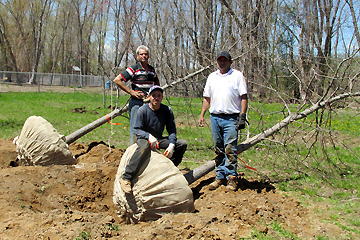 Most of the grant money was used to dig the 26 trees from our tree nursery and to hire two local landscape companies to plant them along the New London Turnpike, in South Glastonbury and other selected locations around town. 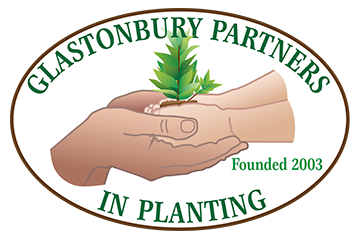 The remaining grant funds will be used to purchase new trees for the nursery and for more planting next spring. GPIP is very thankful to the Sestero Fund at the Hartford Foundation of Public Giving for helping to make Glastonbury a more attractive and environmentally-friendly Town. Your Community Beautification Committee brings you this timely gardening tip. You must have seen trees mulched in this manner. But do you know that this can be harmful and may cause death to your plants? Although roots require a constant moisture supply, the bark cannot sustain life in a constantly moist situation. This constant source of moisture can cause rot, fungus, and diseases to occur in the bark. The mulch around this tree is ten inches deep! It should be no deeper than four inches and the mulch should be back at least three inches from the trunk and root flare at the base. You may not notice any ill effect in the first year or two, but the long-term effect can cause death. 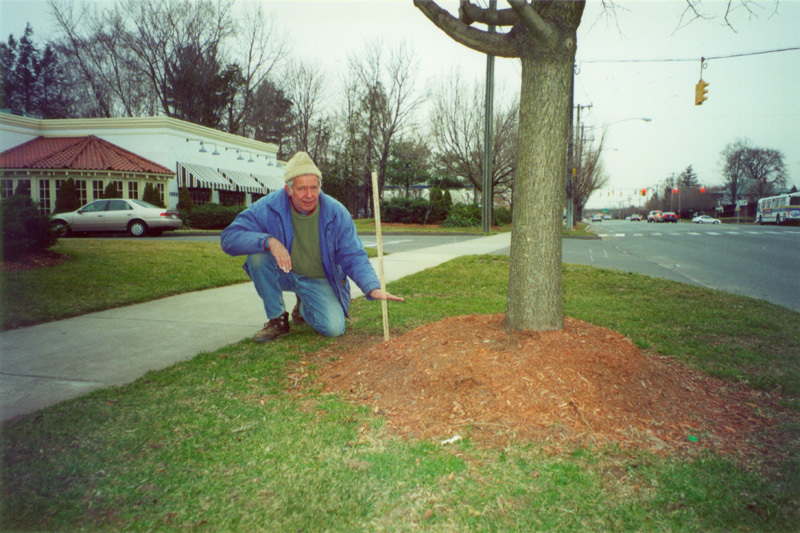 You must keep mulch back at least three inches from the trunk. This includes the portion of the trunk that flares out at the base. The purpose of mulching is to retain moisture, moderate soil temperature, reduce weed competition, protect the plant from mechanical damage from lawn mowers and string trimmers, and add a finished appearance to the planting. But don’t use too much. Two to four inches above the proper soil level is the recommended depth. So if you plan to re-mulch this year, be sure the total depth of mulch does not exceed four inches. The roots near the surface need oxygen. A deep mulch prohibits oxygen from reaching the root system. Organic mulches breakdown and contribute to the fertility and structure of your soil. Fine textured mulches such as leaf compost or finely ground bark mulch should be applied only two inches deep, while coarse textured mulches such as bark nuggets, may be piled up to four inches deep. The coarse nuggets allow more air penetration whereas fine textured mulch packs down and impedes air penetration. Mulches whose main component is wood (cellulose) may attract termites and also tie up the nitrogen from your soil as they decompose. Since bark contains little cellulose, composted bark mulch is preferable over other wood mulches. Many of the red color-enhanced mulches are composed of shredded wood and therefore deplete the soil of the nitrogen that your plants need for good growth. Mulching has many beneficial aspects for your plants. It has the additional benefit of adding a finished appearance to your total landscape. However the mulch should not be the dominant feature of the landscape. The overall design and the plants themselves should be the focal point.